We are offering Finger Bowls to our clients. We are a leading manufacturer of stainless steel finger bowl. We share forefront for manufacturing, exporting and supplying of Copper Steel Finger Bowls in Delhi, India. We can make them available in standard and personalized specifications. Buyers can acquire them in small or bulk quantities as per their requirements. Further, we priced them at marginal prices, so that buyers can easily afford them. For time-bound deliveries, buyers can trust us! 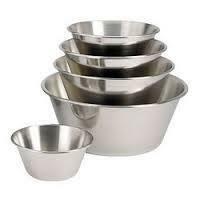 Stainless steel finger bowls are used for serving food in a traditional way. These bowls enhance the traditional way of serving and can be used to serve different items. We manufacture finger bowl in different sizes according to the needs of the customers. Our different variety of finger bowl will surely add style to the table. jain metal & steel has on offer a wide assortment of stainless steel footed bowls that come offered in custom sizes and shapes. Our product can find utility in many places such as drawing rooms, kitchens, or even gardens. With a good finish and corrosion free construct, our product makes for good decorative element as well. To wash the fingers & hands after the meal in a small basin pot & bringing luxury of completing a sumptuous meal & washing hands thereafter, we offer Copper Steel Finger Bowl with Underliner. Warm water is served in the bowl with sliced lemon to clean fingers & making the dining experience hygenic. That's what called luxury at your finger tips. Being a leader in the industry, we are engaged in offering a qualitative range of Finger Bowl. 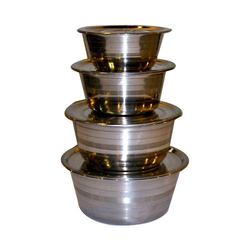 Stainless steel finger bowls are used for serving food in a traditional way. These bowls enhance the traditional way of serving and can be used to serve different items. We manufacture finger bowl in different sizes according to the needs of the customers. This is stainless Steel Finger Bowl with liner available in small, medium and large sizes and in brass also.